THE TAKE HOME: HOW SHOULD YOU BEGIN TO MITO-HACK YOUR ENVIRONMENT TO SEE WHAT YOU ARE MISSING? Let me introduce myself. I go by Scompy as a nickname all over the place, but it’s just my first and last name smashed together. Scompy is also the name of my Journal at Jackkruse.com. My Journal started in mid-July of 2015 and I became a member shortly thereafter. I was introduced to Dr. Kruse by randomly cruising about on the internet. I have been in the video game industry for over 20 years. In a previous solar system not so close, close to the present, I also worked professionally as a biologist at Stanford University in the undergraduate teaching laboratories after graduating with from Oregon State and working as a chemist. I have seen my share of Bunsen burners, beakers, flasks, pipettemen and petri dishes… oh the petri dishes. I typically produced about 3,000 of them weekly for students performing various experiments. As a weird factoid, but I made my transition from biology by way of a video game about the mitochondria. Before discovering Dr. Kruse, I believed that food choice and sugar-control were pretty big players, but somehow, I knew something didn’t add up based on the experienced I had seen with Type II Diabetes (T2D), fat-gains and fatloss through my life in myself and others. A strange thing happened to my mother along her life’s journey. She trekked across the country and lived in multiple states. During all this time, her T2D was just as much of a problem as ever. But in 1996, she moved to rural Illinois and something magical happened. She was in a very cold environment, started talking walks outside in the snow and by that next summer after making it a pattern to get outside, she was no longer obese at all. Her doctor recommended her coming off her insulin injections entirely. A year later, she moved back to the rainy Pacific NW and worked as a front-desk receptionist spending most of her days on the cell phone and under fluorescent lights. A few years of that job, the T2D came back with a vengeance. Lethargy had settled once-again as she lived an indoor life, playing games in front of the computer and watching TV programs until drifting off to sleep. Five months later, I came upon Jack Kruse’s works in a random podcast. The moment I heard his profound connections about sunlight, water, magnetism and electromagnetic fields, I frantically went on a Kruse-binge. Each new blog and video unleashed more of the missing puzzle pieces. In my previous days as a biologist, I never considered to connect the breadth of the scientific disciplines across some of the most basic intersections within physics and biology. Why had I not been taught this in my undergraduate or professional years?! It was like a new web of information opened up in front of me like a hidden garden. My eyes started to open again,… my once nearly-blinded eyes. Kruse’s quantum connections had also played out in my own life previously, In 1994 having steadily progressed from bad health to worse by the end of my college years, I was nearly up to 300 pounds, suffered from high blood pressure, lethargy and insulin swings as I started eating the “low-fat diets.” Then I took a summer-long vacation to Finland and spent a lot of time on bikes outdoors traveling around the countryside. Being close to Lapland, I was getting about 18 hours of sun each day. I was also sleeping on an unheated waterbed, so it was quite frigid, but I didn’t complain. I learned many Finnish customs, like taking saunas, jumping into cold water, boating, eating licorice and the overindulgence of ice cream at summer events. The Finns sustained themselves on a type of dark rye bread only grown in Scandinavia with their homemade summer soups, venison and seafoods. Long story short, by the time I had come back to The States, I had lost over 60 pounds and felt like a new person. It revved me up to continue a new weight lifting regimen at the Stanford Gym. Fast-forward eight months later, I had gained most of my weight back and began to get spells of lethargy and strange skin issues. In the years after my move to Los Angeles from Stanford, weird spots started appearing in my central vision randomly. That same year I had many bad habits like staying up late, and I mean late like until 4am playing various online games. One day at a restaurant, I saw spots manifest on the book in front of me within 10 minutes of eating. After seeing an ophthalmologist and many doctors, they discovered I was leaking blood from smaller retinal capillaries into my central vision on a frequent basis. The drying of the blood within the eye caused blind spots to manifest over time. One day however, a blind spot appeared in my central vision like having a penny about an inch away. The truth-seeking biologist in me decided to engage full thrusters like Scotty himself being okay with over-stressing the ship’s engines pouring through information to find the cause. Could it be something in my environment? My ophthalmologist said to minimize screen-time overall. “Ha!” I thought at the time. “You’re talking to a guy that gets paid to look at screens all day…” At my desk at that time, I had two monitors and two TVs…pretty normal setup for the work I do. I realized I had the monitors within two feet of my face for a good 10 hours a day. One morning about four months later, I woke up and could start seeing tiny holes of light appearing through the blind-spot. It took a few more weeks for the spot to clear out fully. 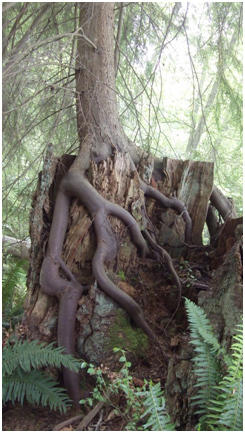 I learned a lesson then… Nature can work its magic over time, often slowly without noticing. So one needs to ask, what happens in reverse when we deny nature? When I turned 30, I moved location from Sherman Oaks, CA into the heart of downtown Pasadena. My new pad was very convenient to work, and as it turned out, very inconvenient for my health status: only 5 blocks away with buses I could hear and headlights passing by on my walls at night as I slept. My diet was rock-solid and so I started attending a fluorescent-lit gym running for hours on electric treadmills after work. You see where this is going? I became so sick, I acquired pneumonia and couldn’t shake it for well over 2 months. Soon after, I woke up at 3am to my heart beating out of my chest. Half-conscious, I was barely able to get out of bed to make a call. The paramedics were quick! After all, my apartment was located in the center of everything. On their meters, they caught the tail end of ‘an event’ and told me my BP had been higher than 220 over 160, but had resolved itself on its own. One guy suspected something larger may had been trying to pass through a valve like a small clot. So the next day at the doctors, a doctor brought in a specialist to check me out. She noticed my thyroid glands were ultra-enlarged . She told me gently that she wanted to swab and take samples to check for probable cancer. The prospect of cancer goes a long way to shape a person’s perspective on life. When I got the news that I didn’t have cancer a week later, I did just about what anyone would do… No, I didn’t party like it was 1999, why would you think that?! I started going to extremes listening to the fitness and food folks (in what Scompy calls the conventional wisdumb) of the time. Therefore, I decided to train for a marathon. Looking back on that decision, it was a life-saving choice, but not for the reason of exercise. That decision removed me from the gym at night because I started walking and jogging 2 to 4 hours each morning. After doing this for months, I had lost a bunch of weight again, rebuilt my pneumonia-scarred lungs and somehow regained my energy levels back. After finishing the marathon with severe leg-cramps and extreme dehydration, I realized I pushed my body too hard. I also developed a strange hip issue in the course of training…the same side I pocketed my cell phone. In my unknown stupidity, I went back to the gym in the evenings. But I had an advantage… the life experiences didn’t take me long realize how good I felt getting outside in the morning compared to how bad it felt going to the gym at night. I canceled my gym membership from that point forward and just took it easy outside from that time onward, even with my hip problem. About a year later, the hip issue cleared up also. I look back to my past failures and compare them with the quantum goodness I have acquired in the past few years as a Dr. Kruse member. Without those health threats and outright failures, I am certain I would just be another Joe believing in the conventional, popping supplements, watching the tube until 1am every night, outright blocking the morning sunlight with sunglasses and clothing while fearing the burn of UVB rays by slapping on toxic sunscreens daily to omit them entirely. When I pursued deeper knowledge of the mitochondria, the Electromagnetic Spectrum, Wallace’s mitochondrial works, Pollack’s 4th Phase of Water and the list continues, I knew the environments we put ourselves in can be either a medicine to keep us in balance or a slow-moving poison to drive us off a crumbling cliff. 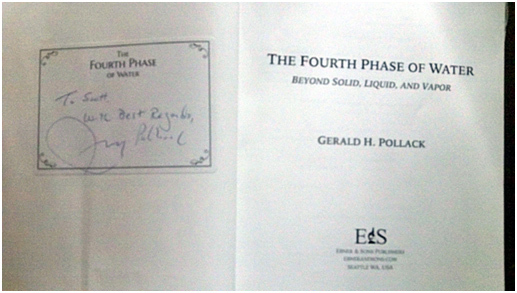 [As a side-note, knowing Pollack himself was just 10 miles away from me in downtown Seattle, I got his autograph foreshadowing the day he takes hom the Nobel Prize]. It is for these reasons, I define “environments in all of their manifestations” as important for human health. My local world includes the broad strokes of environmental considerations down to the micro ones. I consider the atmosphere above, my location on the planet, water sources, the town or city I choose to live in as very major players to my health. But digging down more, I discovered a whole host of issues with my local and micro-environments… home, work, school, shopping malls and even my car. From my measurements last year that you can read about in my Journal, you’ll discover I ditched a very pricy vehicle for and older one and invested a ton of money into my second-set of eyes: my scientific meters with UV light and nnEMF. In part, this is why I started looking beyond Seattle for opportunities in a better quantum environment. During my first year as a Kruse member, I trained myself in the use of electromagnetic detectors to quantify the hidden and artificial EMFs most people interact with daily without realizing. 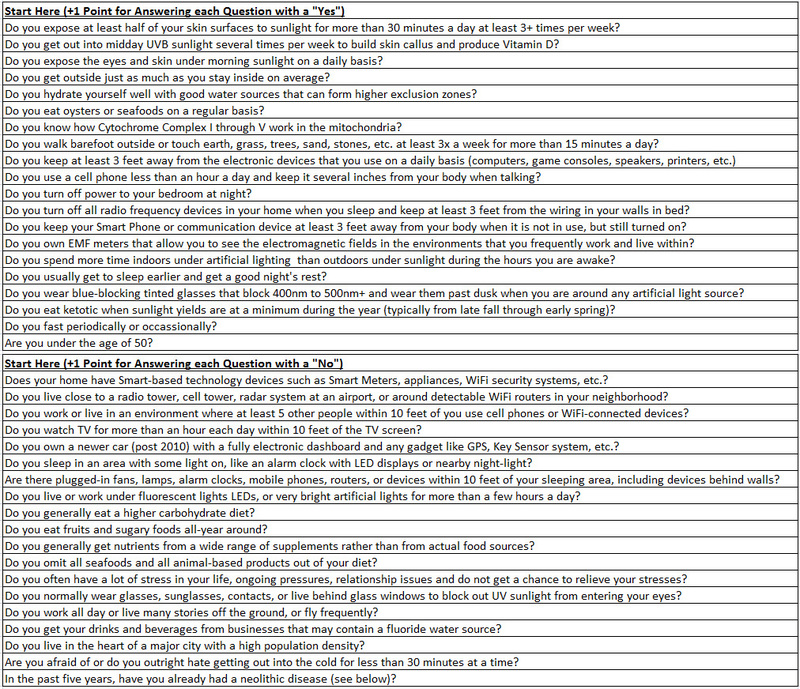 Even though I went through a lot struggle to ‘mitohack’ my Seattle home and on a mission to cleanup my son’s micro-environments because he exhibited many signs of EHS (Electro Hypersensitivity Syndrome), I still didn’t have good access to UVB light. The reality of the cloud-covered Seattle skies made it as-clear-as-day that I was Lightless in Seattle. And with 5G on the horizon, sooner or later I might become sleepless as well. Don’t get me wrong, Seattle has benefits,…you just have to know where to find the beauty hidden among the noise. But could I use these benefits on a daily basis? No. It turns out, the Pacific Northwest has the worst percentage of sunny days per year: Seattle takes 1st Place in the continental USA for the least number of sun-days and Portland, Oregon is #2. My EMF meters also told me cell towers going up everywhere. Knowing 5G was on its way and the family wanting more sun, I started looking for opportunities over a year ago. It took time, but I found a perfect career fit in Bend, Oregon, so I researched the region. Upon closer investigation of Bend, it sits at a higher altitude around 3,500 feet against about 10 mountains on the east side of the Cascades with ancient formations, a fluoride-free watershed, lower population density and access to the nearby mountains at 7,000 to 10,000 feet within a few minutes. More quantum kickers: the area is a high-desert pine forest (tons of O2), has snow on the ground about half of the year and gets some of the highest amounts of sun-days per year in the country. Next on my plate was finding a home with a great advantage for my micro-environments. Because I wanted more access to sunlight and inside of the home if possible, I looked for homes with lots of skylights and windows, but also far enough away from the general population for a baselined RF EMF measurement. That required at least a half-acre of land to gain distance away from other homes with routers and other tech gadgets. I also looked at the home’s design and specifics such as where the circuit breaker box was located, what rooms could be shutdown with power while leaving other rooms on if needed, proximity to streets and how busy the streets might be, and so forth. I came armed with my meters and let my real estate agent know my issues. Out of the eight homes I toured, five had the latest high intensity RF smart meters that max’ed out my Cornet at close proximity. Most homes were also tucked into tight neighborhoods on less than 0.2 acres of land. I labeled them all as no good. Two more homes were on more land, but I found had some major problems. One had a power transformer less 20 feet away where magnetic fields from could be detected inside. 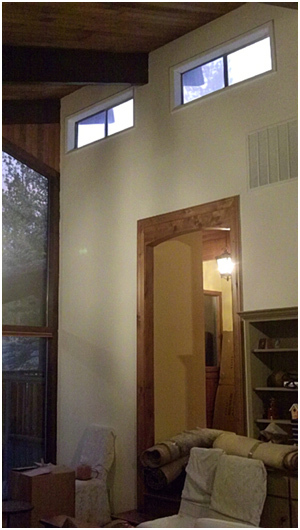 Another home had really bad lighting into the home and trees that blocked sunlight throughout the entire property. But I was in-luck more than I knew with the last home. It was far more costly due to its remote location near the river on 0.7 acres, but it was built in the 1960s and every room was on the 1st floor. It still had the original glass throughout, including vertical skylight panels in every room and giant floor to ceiling windows to let light in everywhere. The glass had thinned out over the decades, and upon taking measurements around lunch time, I was getting UVB 2 inside. But it gets even better. 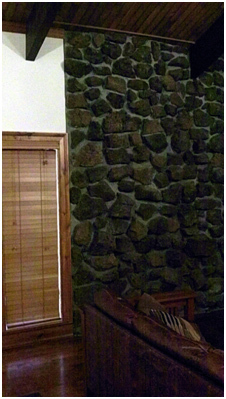 The main living room was built with huge floor to ceiling lava walls for grounding indoors. 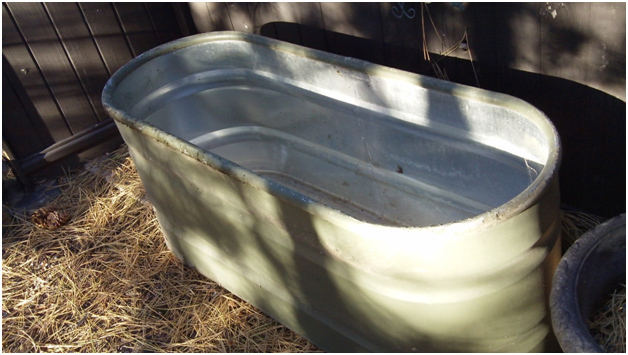 Strangely enough, the previous home-owners had been feeding deer using a 100 gallon water trough that is now my outdoor CT tub. I thought about all I had learned over the past two years and focus it on the environments we allow into our lives. It spawned the concept of a ‘Quantum Quiz’ aimed at people with less knowledge about the interactions of sunlight, water, magnetism and nnEMFs. I crafted the quiz to be educational with each question designed with a purpose in-mind. Here is the test if the reader wishes to take it. Part 1 and 2 are a series of questions for answering Yes or No. Part 3 is the Results Section to receive your grade. 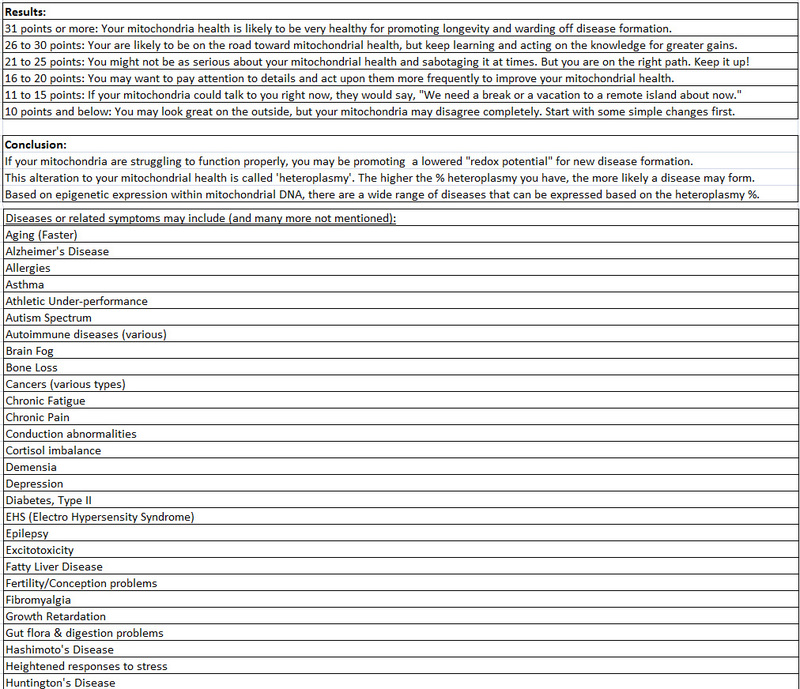 I also took some time to provide a list of some of the major diseases that are linked to the mitochondrial dysfunction. Keep in mind that I designed the Quiz as a stepping stone to dig deeper and question my questions that I pose to you. Seattle works well for those that either fear UV light or those that wish to crash their Vitamin D status. Coffee sells, huh? I could have kept up the bandages by flying the family to tropical or higher altitude locations continually to revitalize them, or I would have to bite the bullet and take a risk. I could have looked at the move as a stressful-one. Instead, I rolled with the punches, took each step at a time and ran the marathon. Is your cup half-empty or half-full? It’s true that technology’s intersection with our biology is shaping up to be our greatest hurdle to complicate our health as we move into the future. There are many elements we can control in our local and micro-environments. But if you lack a great lack of control where you live, it may require you to change your location to find a more optimal fishbowl. Or you could hire an nnEMF engineer yourself.